It was so wonderful to have adopted and helped out a family this holiday season and we could NOT have done it without your support! Thanks so much to everyone who was able to help us deliver a Merry Christmas to this family. Happy Holidays everyone! During the LIVE from CHA event at Anaheim next month, several designers will be “dressing Elena” and we’re going to be interviewing them about their creations. During these interviews, Westcott has provided us with 5 giveaways!!!! A new canvas is now circulating through a group of talented artists to become the next in our “Hope” series. This time, it’s Hope for Change. The canvas will be made into prints that we are selling to raise money for the Sandy Hook Memorial. Order your 8 x 10 prints for only $24.99 here. 80% of the purchase price will be donated to the memorial. Hope for Hurricane Sandy Victims Canvas is Complete! Check out these pictures of it – it’s simply stunning! Stay tuned for our next Hope canvas for the Sandy Hook School memorial. Seaside Soiree 2012 was definitely a HUGE success with all the arts, crafts, food, and unforgettable laughs. This three-day retreat had so much going on that there was no way that any participant or volunteer could not have fun. Since I have never attended a Seaside Soiree event before, I was nervous about the sheer magnitude of working an event this large. However, with amazing planning and awesome volunteers, this whole weekend came together beautifully. On day 1, we had set up all these decorations and tables outside for the crafting to beginning. However right before the event started, there was a slight problem that arose…it started raining. Yes, the hard work we did on setup was lost, but did that put a damper on the night? Of course not! We merely moved everything inside. Were we all snug inside the Martin Johnson House? Yes, but that’s the point of a retreat right? Haha. As soon as the ladies got to the house, we begin our first class with Jennifer Priest and her adorable altered dress forms! We also began to ice resin pieces of JenCushman’s Fly With Your Hearts Desire Art Journal. After a crafty night like that, you think it would stop there. But the party continued at the hotel where we had an ice cream social and art swap. It was such a great time for everyone to get to know each other, trade art, and enjoy some tasty sweets. Day 2 was just as busy as some attended an early tour of the Scripps Institute of Oceanography Pier tour with Jesse. Then the day kicked off with Danita Art’s class where she showed all the women how to make their own personalized mermaid! Soon after, they were able to finish completing their Art Journals with Jen. Then the nightly activities began with “Dinner by the Seaside”. It was extraordinary with all the Seaside Soiree attendees and special guests. We were lucky to get amazing food from Villa Capri and Whole Foods like Spaghetti alla Puntanesca, Gambero alla Senape, Thai Chicken Skewers, and Spinach Savory Pastries to name a few. And what kind of dinner would this be without alcohol and coffee! Roast Coach Coffee Bar was there to serve coffee all night long with a huge assortment of beer from Wetten Importers and wine from One Hope Wine. And if that wasn’t enough, we had a rockin’ photobooth. If you want to check out the photos, click HERE. However, the best part of the dinner was definitely the silent auction that took place. Thanks to everyone’s help, we were able to raise so much money for the CharityWings Art Center and the Scripps Institute of Oceanography. Unfortunately the fun had to end sometime, but Seaside Soiree concluded with Cheryl Waters’ class making a vintage wall hanging and a fun Artist Faire. Sprinkles Cupcakes was nice enough to donate cute mini cupcakes for everyone to enjoy as they shopped around the faire and buy some amazing goodies to take home with them. Seaside Soiree 2012 has come and gone, but we’ve all built some wonderful memories with one another. So see you there next time. But in the meantime, check out some photos from of the event HERE. Well, our first Saturday Crafts Fair was a big success! Thanks to all who were able to join us live. If you weren’t, just scroll to the bottom of this post for the playback link. A huge thanks goes out to Susan Brown who showed us how to make these super cute tags! I (Cyn) also demonstrated how to make this pretty, kind of rustic looking tree out of old magazine pages. If you would like to check out these projects here’s the playback link! Join us on December 8th, 15th, and 22nd at 4 pm Eastern for another Saturday Crafts Fair show! 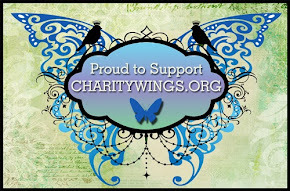 Charity Wings Live Online Crafting Demos at Saturday Crafts Fair ! That’s right – we’ve got a “booth” at Linqto’s new Saturday Crafts Fair and we want you to join us! Every Saturday from 3 to 5 pm Eastern, Linqto will be holding an online craft fair with multiple “booths” to visit in each time slot. Our time is from 4-5 pm Eastern on Saturday December 1, 8, 15, and 22, and we’ll be having a variety of guests there including Lisa Fulmer, Susan Brown, Cyn Gagen, our very own Elena Lai Etcheverry, and more to help share in the fun! During our time slot, you can head on over to the landing page for the Saturday Crafts Fair and choose the Charity Wings Parlor. Did I mention that Linqto is providing us with some swag to giveaway? During each one of the shows, we’ll be drawing for a $50 Michaels gift card. AND there’s a grand prize of an iPad Mini being giving to one lucky recipient! Look for the link to enter the giveaway on the main landing page for the craft fair. If you have any problems entering the “booths” or with any other technical issues, look on the main landing page for the “tech support room” where a Linqto service rep will be on hand to answer your questions and assist you. You can find out more on the Saturday Crafts Fair Facebook Page and the event page. Invite your friends and come have some fun with us! Thank you so much to One Hope Wine for supporting our Dinner by the Seaside. One Hope Wine is providing some free wine and wine service for the dinner. In addition they will be taking orders at the event and 15% of purchases made will be donated to our cause. We appreciate the support so much! Charity Wings has adopted a family from the San Marcos Boys’ and Girls’ Club for this holiday season and we’re hoping you can help us out with some donations! This family was chosen because of the outstanding citizenship exhibited by one of the little girls both at the club and within her own family. Money is extremely tight for this family as the mother is out of work. Please help us to help them! We would need all wrapped donations to be received by December 7th. Please let us know what you’re donating in the comments and we will keep updating the list. If you can send a Christmas Ornament with your gift, that would be great! Does not need to be handmade. Any ornament to put on their tree! He wears children’s size 8 shoes and needs new shoes. He wears size 4T shirts and pants and needs clothing. He needs a winter jacket. She wears infant’s size 5 shoes and needs new shoes and boots. She wears size 2T clothing and needs clothing. She needs a winter jacket. Girl, aged 8 – Favourite colours: pink and purple, Favourite movie: The Lorax. She loves to play basketball. She wears children’s size 1 shoes and needs new shoes and boots. She wears children’s size medium shirt and children’s size 8 pants and would like new clothing. She wears children’s size 5 shoes and needs new shoes. She wears children’s size medium shirts and children’s size 10 pants. Mother – Favourite colour: black, Favourite movie: Shrek. She loves to read with her kids. She wears size 6 shoes and needs new ones. She wears a size L shirt and size 9 pants. He wears size 8 shoes and needs new ones. He wears size L shirts and his pant size is 36 x 32. In addition to the items that are stroked through above, we have received some stocking stuffers for the kids, a kids' movie, and a child's blanket. You can also donate money and we will use it to purchase items for the family. Thanks so much for your help! Artists' Faire by the Sea! and shop the Charity Wings store! 20% of sales will be donated to the Charity Wings Art Center! Come out and meet these beautiful artists and shop. if that doesn't get you here, we will also have lemonade and Sprinkles cupcakes!! After recent additions by Kelly Lish – now on its way to Marah Johnson, Tiffany Windsor, Candy Rosenberg, Melody Ross, Pam Carriker, Jodi Ohl, and Flor Larios! Right now a beautiful 9"x12" canvas is making its was across the country to 10 artists who are each adding a piece of themselves to it. In the end, we will have a beautiful piece of collaborative "wing art" that we will make prints from to sell and raise money! CLICK HERE TO PRE-ORDER YOUR BEAUTIFUL MATTED PRINT. ONLY $24.99 + shipping each! Think presents, think holidays, think birthdays, think Christmas! And to help you with that, its Buy 4 get one free! Follow the progress of our little canvas here on the blog or Facebook. Elena started the canvas by painting the background and adding a heart covered with music paper from "Somewhere Over the Rainbow" To read more about her inspiration for this project and the canvas, please read her touching blog post here. Please join us for a beautiful Dinner and Silent Auction to support the Charity Wings Art Center and Scripps Institution of Oceanography. Scripps Institution of Oceanography is one of the oldest, largest, and most important centers for ocean and earth science research, education and public service in the world. Purchase your tickets by clicking on the link in the sidebar to the right! World Cardmaking Day Sponsor Shoutout! I just wanted to take one more opportunity to say a HUGE thank you to our sponsors for our World Cardmaking Day event. We could not have done this event without all of our amazing sponsors! Please show them some love by visiting their sites, liking their Facebook pages, and following them on Twitter! Raising money for Charity Wings and the Scripps Institution of Oceanography! This is an event to remember! Back by popular demand, this amazing 3-Day Mixed Media Art Retreat is filled with art, creativity, charity, and good times. Your journey will begin will a beautiful cocktail reception and sunset dinner and we'll go from there! We will be hosting several guest artists for you to be inspired! FIVE awesome classes and projects, charity and camaraderie! We will have an amazing silent auction and raffle of handmade art from your favorite artists! You do not want to miss this! One of the amazing artists joining us that day is Jennifer Priest of Hydrangea Hippo. Just have a look at the pictures of the wonderful project Jennifer is going to be teaching – a beautiful altered dress form! Those taking the class will have the option to make either the undyed or dyed version as seen here. Only 3 spots left for this awesome event! Click here for more information and to buy your tickets!